Whether for a bright, contemporary floor or for a light, rustic appearance, Maple (Acer saccharum) is a durable choice in wood flooring. Harvested from the rich bottom reaches of upland drains, our Maple comes from the lower Appalachian hills of middle Tennessee and Kentucky. A traditional wood for gym flooring, Maple is also beginning to displace Ash for use in major league baseball bats, so it is no surprise to learn it is a harder wood, resistant to scuffs and dings in service. Maple has a quiet grain that is typically finished with a natural topcoat. It can be stained, though this requires popping the grain and some expertise on the part of the finisher. With its light color, wide widths in Maple tend to have visible season joints during the heating season so thought should be given to maintaining interior relative humidity during those months. 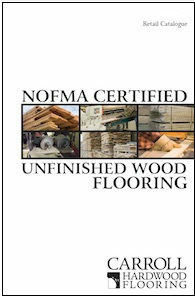 Please download our retail unfinished flooring catalogue from the tab below. It contains our most recent pricing and grade descriptions. Often used for a fresh, contemporary appearance, Select Maple is a light-colored floor varying in color from paper-white to a cream color. A small amount of light brown heartwood will also appear, generally as a flash here and there on the sides or ends of pieces. Maple also has a characteristic dark mineral streak appearing occasionally, generally 1/16” to 1/8” in width and 1”-3” in length. Nevertheless, the overall impression is of a light, relatively uniform floor. 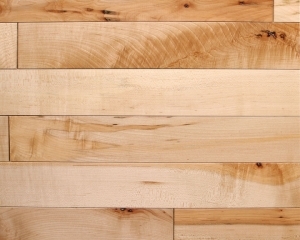 Select Maple is available in a Natural finish. With sound, tight knots and abundant brown heartwood, Character Maple makes an excellent rustic floor where an overall light appearance is desired. This grade admits knots up to one inch in diameter, unlimited brown heartwood, black and green streaks, bird peck, wormhole, and small bark pockets. It generally ships with a longer length average than most hardwood floors. 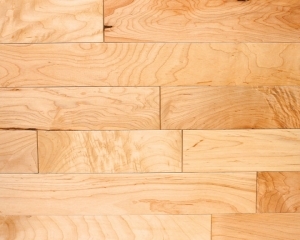 Character Maple is available in a Natural finish.